Yet many who reside in the United States view the war on Syria from the lens of the US empire. This lens is articulated by both US political parties, their foreign partners, and their faithful corporate media servants. These expert liars claim that Assad is a butcher and the Syrian government a brutal “regime.” They don’t talk about how the US military occupies a large portion of Syria, coincidentally in the country’s most resource rich region . Also ignored is the fact that US allies such as Saudi Arabia and Turkey have loathed the Syrian government for its decision in 2009 to construct an independent pipeline with Iran and Iraq to transport precious gas and oil resources to European markets. Never mind that the US, Saudi Arabia, Qatar, Turkey, and Israel to name a few have funded and armed hundreds of thousands of jihadist mercenaries for seven years in hopes that they would rid of pesky Assad and his nationalist policies. 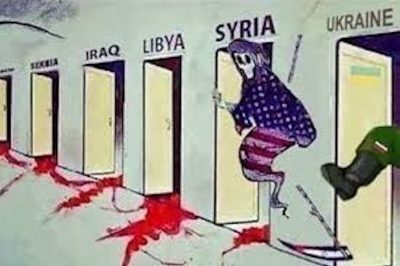 Imperialism wants Assad out because he stands in the way of US goals to dominate the region and keep Iran, Russia and China’s rise to global prominence at bay.